In the aftermath of mass shootings in the US, gun control advocates invariably point to Australia as having solved the problem. However, it may not be as simple as copying and pasting legislation to fix the problem. The most recent school shooting at the Stoneman Douglas High School in Parkland, Florida, in which 17 people were killed and 14 injured, has again kicked off one of the most volatile, emotive and divisive political footballs in US politics. Gun control advocates say “enough is enough,” with victims-turned-advocates speaking out in televised town halls, while conservatives and Second Amendment purists call for more “good guys with guns” and deny or deflect that there’s any problem at all. It didn’t take long before Australia’s gun buyback program was once again touted as a potential solution to America’s mass shooting problem. Only 2,417 semi-automatic weapons were handed over in 2017, according to the National Firearms Amnesty Report 2017. In addition, 4,816 “air rifles” were submitted in the amnesty and 162 “imitation” guns were handed in. However, more than 37,000 of the 57,000 figure were either being sold or were merely being registered officially, not actually being taken out of circulation. Gun Control Australia believes that lawmakers, as well as the general population, are becoming “complacent” and worries that compliance has slipped in Australia. While it’s still legal to own a gun in Australia, it’s a complex and stringent process to go through, on paper at least. Owners are legally obliged to store firearms in gun safes and ammunition is to be kept in a separate compartment, all of which is subject to regular police inspection. “There is no doubt that Australia’s gun laws has saved many lives and prevented an unbearable amount of grief,” Samantha Lee, Chair of Gun Control Australia, told RT.com. “The rates per 100,000 of total firearm deaths, firearm homicides and firearm suicides all at least doubled their existing rates of decline after the revised gun laws,” a study, published in the peer-reviewed journal Injury Prevention in 2006 and republished in 2015, concluded. “The gun laws’ main goal was to stop massacres: 13 in 18 years, then NONE in 22 years. Not rocket science,” the study’s lead author Professor S. Chapman of the School of Public Health, University of Sydney told RT.com. “Gun ownership has certainly increased in Australia since 1996. The SSAA is approaching 200,000 members who participate in sports shooting or hunting and more than 1 million Australians own firearms,” Fantinel added. 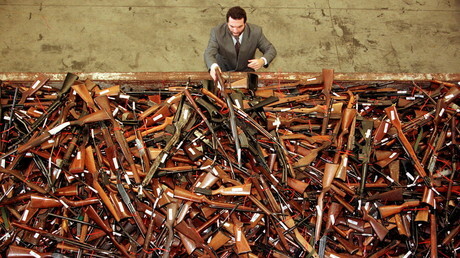 Population growth has, meanwhile, outpaced the arms trade so per capita firearm ownership is still 23 percent lower than it was prior to the Port Arthur massacre. “The proportion of households with a firearm fell by 75 per cent since 1988. Those who already possess several guns have bought more,” Alpers said.